Eddie McCormack is out in front in Portugal. Picture courtesy of Pat Cashman/GUIGalway’s Eddie McCormack fired a second round 71 to grab a one-stroke lead at the halfway stage of the Portuguese Amateur Open at Montado near Lisbon. The 39-year old Cavan man, who was tied for fourth after an opening 69, bounced back from early bogeys at the first and fourth with an eagle two at the 10th. He then followed a bogey at the 165-yard 12th with a three consecutive birdies from the 13th before closing with a bogey at the 170-yard 18th. McCormack leads on four under par 140, a stroke clear of Finland’s Tapio Pulkkanen, Holland’s Daan Huizing and Frenchman Paul Barjon. Forrest Little’s Eoin Arthurs is the next best of the Irish, tied 15th on level par after a 73 with Knock’s Nicky Grant a shot further back in 18th after a joint best of the day, five under par 67. Grant opened his week with a 78 but improved by 11 strokes as he erased three bogeys with an eagle and six birdies. The rest of the Irish contingent has work to do to make the 54-hole cut for the top 40 and ties. Harry Diamond is three shots outside the mark on six over after a 73 with Rory McNamara (73) and Walker Cup player Alan Dunbar (75) on seven over. Matthew Wylie was recorded as a “No Show” following his first round 79. Title favourite Alan Dunbar remained at the head of affairs entering today’s final 36 holes in the East of Ireland Amateur Open at firm and fast County Louth. The 21-year old Walker Cup prospect avoided the worst of the wet and windy morning conditions yet while he failed to take advantage of a major break in the weather after lunch he was still pleased to limit the ‘damage’ to a level par 72. “I struggled today but I still managed to get it around,” said Dunbar, who leads by a stroke on four under par 140 from Galway’s Eddie McCormack, Ballymena’s Dermot McElroy and Headfort’s Rory McNamara, who carded a best of the day 68 in the worst of the early conditions. Eddie McCormack. Picture courtesy GUI/Pat Cashman.Eddie McCormack is just a shot off the lead after the opening round of the Portuguese International Amateur Championship at Montado. 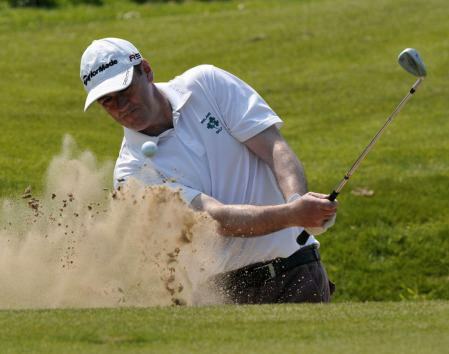 The Galway representative is tied for fifth place after firing seven birdies in a three under 69 to lead the Irish challenge at the Setubal resort south of Lisbon. Montado Golf Resort.Eddie Cormack paid the price for a poor start and slipped six shots behind leader Moritz Lampert of Germany entering the final round of the Portuguese Amateur Open Championship at Montado near Lisbon. The Galway international carded a one-over par 73 to finish the day in a four-way tie for third place on three under par as Lampert fired an albatross, an eagle and four birdies in a superb 65 to lead by one from Adrien Saddier of France on six under. Eddie McCormack rebounded from an opening 80 with a 70 in PortugalLimerick’s Pat Murray is the only Irish player on course to make the 54-hole cut in the Portuguese International Amateur Championship near Lisbon. Pat Murray in aciton at Baltray last year. Photo Jenny Matthews/www.golffile.iePat Murray struck a blow for the old-fashioned amateur when was the only member of the Irish sextet to make the cut in the Portuguese International Amateur Championship.